technicians and certified meeting personnel. and nine food and beverage outlets. and the National Archaeological Museum Aruba. Balinese luxury at the Mandara Spa, and try their luck at the 18,000-square-foot, 24-hour Stellaris Casino. Nine bars and restaurants range from an outpost of American favorite Ruth’s Chris Steak House to Atardi, which pops up on the beach every day to serve its signature seafood dishes and more. More than 10,000 square feet of meeting space proves equally impressive, with its mix of business savvy, versatility, and island flair. While the largest of seven conference rooms hosts up to 880 delegates indoors, three outdoor venues set the stage for up to 500 guests under the sun and stars. The catering team creates custom cuisine for any occasion, from morning breaks to themed dinners, and an in-house audiovisual department and certified meeting professionals guarantee the success of every gathering. As evenings wind down, attendees inevitably disperse to their choice of 414 guest rooms and suites, all modern in style and featuring private balconies with garden or ocean views, LED TVs, and sumptuous bedding. Overall, the property’s diversity of worldly and simple pleasures — plus first-class facilities, dining, and service — earns it a perennial spot on lists of the world’s most recommended destinations. Fabulous location and great hotel. Group had an excellent time on Aruba, some felt this property was too far out from town area. Staff is exceptional - all over, rave reviews from attendees. Dining is limited and attendees often left the property for restaurants, not a problem, but would like to have more choices on property. Groups do not get lost among the Marriott vacation club members, which had been a concern. Beach can get very crowed quickly, causing some "noise". Aruba Marriott Resort & Stellaris Casino is pleased to introduce the recent addition of the island’s largest Starbucks, a Gelato & Co. outlet, plus enhancements to its Great Room and Lobby Bar as well as a complete renovation of the two-story fitness center. Replacing Aruba Marriott’s Lobby Café is a brand new Starbucks, which is now the largest Starbucks location in Aruba. The Starbucks has a modern, open design with rustic wooden panels, brass accents, as well as the first “Wall of Chill” in the Caribbean, a grab-and-go refrigerated section built into the wall. In addition, the Starbucks features an oversized, unique siren mermaid painting by Colombian artist, Natalia Perez Penagos, which depicts a mermaid swimming towards the counter to catch an aroma of coffee. Holding true to its dedication to environmental initiatives throughout the property, Aruba Marriott uses energy efficient machines in its Starbucks store. and Nutella sauce. For those looking for a healthier option, the fruit sorbets are a sure bet, made using fresh fruits. Those with a larger sweet tooth must try the Gelato popsicle, which is dipped in white or milk chocolate and covered with toppings for an extra delicious dessert. sushi bar. The lobby’s Great Room was refreshed with a beach-chic look and feel thanks to new light fixtures and coastal-inspired furniture and décor. guests see when they walk into the hotel and it’s important for us to welcome them into an inviting atmosphere right away,” said Tom Calame, General Manager. adults-only pool, beach, and ocean. PALM BEACH, Aruba " January 2009 - Aruba Marriott Resort has announced the completion of its $50 million property renovation. The enhancement project included a complete makeover to each of the 411 hotel guestrooms, the addition of a Ruths Chris Steak House, a redesign of La Vista restaurant, an overhaul of the lobby and reception area, and the creation of Tradewinds Club, the Aruba Marriotts premium hotel-within-a-hotel accommodations. The guest response to the renovation has been overwhelmingly positive, stated General Manager and Vice President Rick Zeolla. Were thrilled that our vision has finally been realized and look forward to sharing our new look with all of our guests in the coming months. All hotel guestrooms are fully renovated with a sleek, modern design and the latest features in state-of-the-art technology, including LCD televisions and jackpack technology. Marriotts indulgent Revive bedding is in place and marble floors and counters, contemporary sink fixtures and rain-style showerheads have been installed. Tradewinds Club, a 59 room hotel-within-a-hotel has been introduced on the 8th floor of the resort. It provides guests with exclusive access, special services, upscale amenities and deluxe food and beverage offerings. Privileges include access to the 1900 sq. ft. Tradewinds Lounge with 200 sq. ft. terrace; private check-in; upgraded bathroom amenities; deluxe robes, slippers and a pillow menu; unpacking, pressing and packing assistance upon request; preferred spa and restaurant reservations; a dedicated concierge staff; secluded beach area exclusive to Tradewinds guests; free wireless internet access; and complimentary, gourmet food service five times daily in the Tradewinds Lounge, along with an open bar. The hotel lobby renovation features a streamlined look with cozy corner and group seating, lounges and a view toward the ocean through the glass lobby front. It also includes the introduction of a brand new Lobby Bar and a makeover to the 24-hour Lobby Caf and Ketsu Sushi Bar, along with wireless internet access. La Vista is completely redesigned with a new look that seamlessly merges the indoors and out with floor to ceiling windows overlooking the waters of the resorts freeform pool and the Caribbean Sea. This new restaurant provides a more spacious and open environment, cozy bar and lounge and enticing new menu. Finally, a Ruths Chris Steak House has opened at the hotel featuring an intimate bar area with wooden floors, cherry wood wine display and limestone bar top and a split-level dining area with rich, chocolate brown carpeting, antique mirrors and elegant lighting. 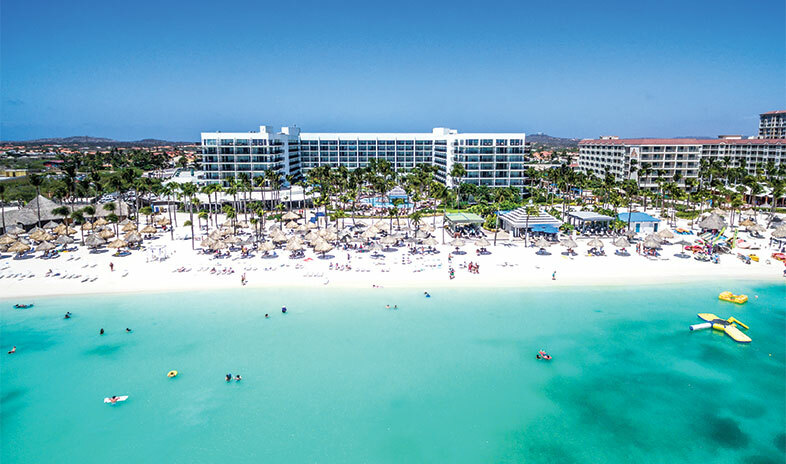 The award winning Aruba Marriott Resort & Stellaris Casino boasts 411 guestrooms -- the most spacious accommodations in Aruba -- each with large, private balconies overlooking lush landscape and the sparkling waters of the Caribbean Sea. On property, seven restaurants and cafes provide fare from light to elegant, while the largest casino in Aruba, a 6,500 square-foot spa, free-form swimming pool with cascading waterfalls and high-energy health club offer entertaining diversions. To obtain more information call the Aruba Marriott Resort & Stellaris Casino at 888-PARADISE or visit the Arubahttp://www.arubamarriott.com Marriott Resort website or our Aruba Playground website. Welcome to the website of the Aruba Marriott Resort & Stellaris Casino. With a $40 million dollar renovation, the Aruba Marriott Resort invites guests to come and enjoy the "Playground for all Generations." For your convenience the latest press releases on our renovation can be downloaded here.